Veganuary has come back around and you cannot avoid the multitude of articles popping up on your Facebook feed about the ‘10 best Vegan restaurants to dine at’ or ‘10 things every Vegan knows.’ So much so, that it can even make a well-meaning pescatarian like me to roll their eyes at the very sight of the word. However, once we scratch the surface of this so-called trend, there is so much more substance. So why does much of the conversation on veganism revolve around things like what Piers Morgan thinks about vegan sausage rolls? Are we missing the real point? A pretty reasonable statement to get your head around right? It’s at this point you might be nodding along and saying ‘that’s all well and good, I just hate it when vegans try to shove their lifestyle choices on the rest of us.’ Hell, I might have even been one of those people a few years ago, but when we really break it down it’s not hard to figure out why vegans are so passionate about their cause. It has been proven to us time and time again that pigs are just as intelligent, if not more, than dogs and even outperformed three-year old children in cognition tests. They are also incredibly social creatures who form strong relationships. 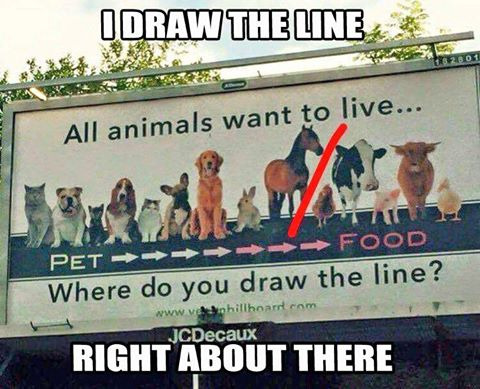 ** Yet, we still continue to tell ourselves it’s ok to eat them because they’re ‘food.’ When PETA released their ‘where do you draw the line campaign’, many people created memes and declared that it was quite easy to know where to draw the line. However, it’s clear that the ease in which we draw the line is a cultural one, which is demonstrated by people’s outrage over the Yulin dog meat eating festival in China. If we blame culture for our cut off point, then it’s hypocritical to chastise this tradition. Some argue they disapprove of the way the dogs are treated, yet when we turn a blind eye to the farming conditions in this country, we don’t really have a leg to stand on. So really, what makes Ariana Grande’s pig, brilliantly named Piggy Smallz, worthy of likes and followers but exempt from our plates? Despite these complex and needed discussion topics, I feel like most of us seem to reduce vegans to a crazed group of people hellbent on ruining the pleasure of food for everyone. In fact, before I started to read and learn more about this topic, I found it easy to lambast vegans as a group of over-reactors. This is mainly due to the discourse on the subject we see on TV debate shows and articles revolving around fanatical vegans. However, just as conversations are opening up on topics such as feminism and environmental issues (which veganism certainly falls into), it is time we at least open ourselves to the vegan point of view in spite of how ‘on trend’ it may be to mock and write off the whole vegan way of life. Yes it is the natural reaction of people to say ‘how dare you tell me how to live my life’ but would we ever say the same thing to someone who was telling us to use less plastic? We need to stop seeing veganism as an alien notion, but rather listen and learn from people who are passionate about being kinder to creatures and helping the planet.